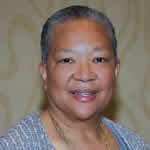 Carol Belle-Thomas Moss , a native San Franciscan, educated in the public schools system, received her BA and MA from San Francisco State University. She retired from City College of San Francisco after 41 years of service as a Media Specialist and Instructor. She continues to serve as Affirmative Action Monitor for Hiring Committees at the college. She has served on the National Council on Black American Affairs Board for over 20 years and is currently Co-Vice President of Programs. She is also one of the longest serving board members on the Western Region Council on Black American Affairs and is currently Vice President of Programs. Her membership and participation in numerous community and professional organizations have all benefited from her advocacy, leadership and activism.